The past two years we’ve had our own Bad Hessian shindig, to much win and excitement. This year we’re going to leech off other events and call them our own. The first will be the after party to the ASA Datathon. We don’t actually have a place for this yet, but judging will take place on Saturday, August 16, 6:30-8:30 PM in the Hilton Union Square, Fourth Floor, Rooms 3-4. So block out 8:30-onwards for Bad Hessian party times. The second place you can catch us is with the rest of the sociology blog crowd at Trocadero Club, Sunday, August 17, at 5:30 PM. If you haven’t had enough, you can probably catch many of us at ASA Karaoke 2014: Computational Karaoke in the Age of Big Data. Bonus points for singing the most “big data” of songs. 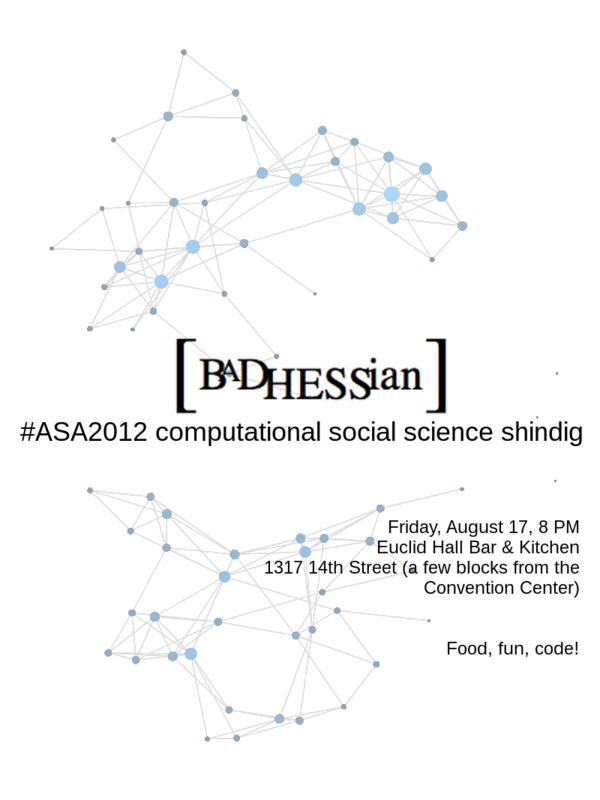 #ASA2012 Computational Social Science Shindig! Going to be at ASA? Come hang out with the Bad Hessians! Friday, August 17, 8 PM.